The New York Modern Museum of Art is running an exhibition of film maker Tim Burton's work from November 22- April 26, 2010. This amazing collection of paintings, drawings, videos, sculpture, and film props is drawing record crowds of all ages. Just as a Burton movie is unmistakable (Beetlejuice, Edward Scissorhands, Nightmare Before Christmas) Burton's art is just as distinctive: a gallery of odd creatures and characters taken from a variety of inspirations such as Japanese monster movies, side show carnivals, sci-fi films and other fantastical expressions of Pop Culture that have tickled the quirky director's fancy. The exhibit includes over 700 examples of Burton's sketchbooks, drawings, paintings, and amateur films. He made seven sculptures for the exhibit, and music from long time collaborator Danny Elfman plays in the galleries. Crafters and artists in any medium can find inspiration at this show. 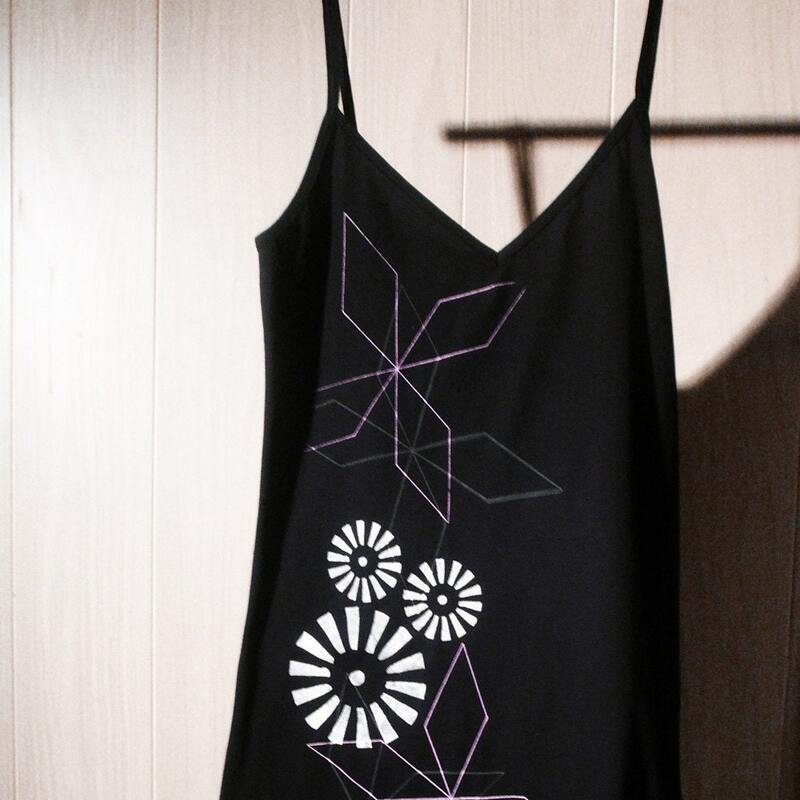 Consider Kimm Chi, who creates beautiful silkscreened apparel featuring bold and abstract designs. Although Kimm's work is very different from the work of the famous director, she still left the museum feeling inspired and in admiration of Burton's ability to be so prolific. She told us that while at MOMA, she chatted with a guard who told her that the exhibit was an unexpected hit for the museum, drawing in enormous crowds like Matisse or Picasso, and that the museum was amazed with the response, and it was great to really see people of all ages appreciate the work outside of just the movies. Kimm was moved to blog about her response to the show here. TODAY you have a chance to win a piece inspired by Tim Burton's artwork from the Etsy shop Lennymud. 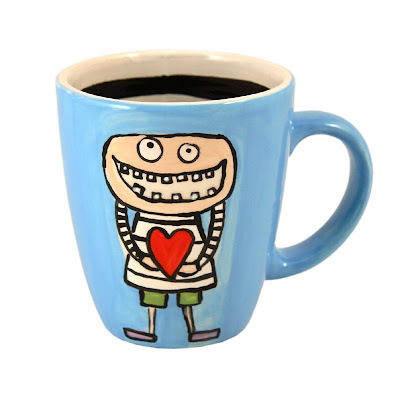 This whimsical monster mug can be yours just by leaving a comment below and letting us know what you would like to see more of on this blog. We've been trying a lot of different things this month and we'd like to hear from our readers. Why do you read this blog: for crafting info or tips, info about art events in NYC, etsy info or any other reason. Just comment below and you are automatically entered to win. Winner announced APRIL 6. Congratulations to the winner of the giveaway print from PrismPop, CHolloway, and the winner of the bracelet from Wabisabi Brooklyn Friendliest Ghost. Please contact the shops to claim your prizes. I love the Etsy info. Thanks for the giveaway! Awesome giveaway! I'd love to see more interviews from artisans as Gabriella mentioned. LennyMud's shop is amazing! I enjoyed the artist interviews, but I also like tutorials. I always learn something new from a tutorial and it keeps me coming back for new projects. 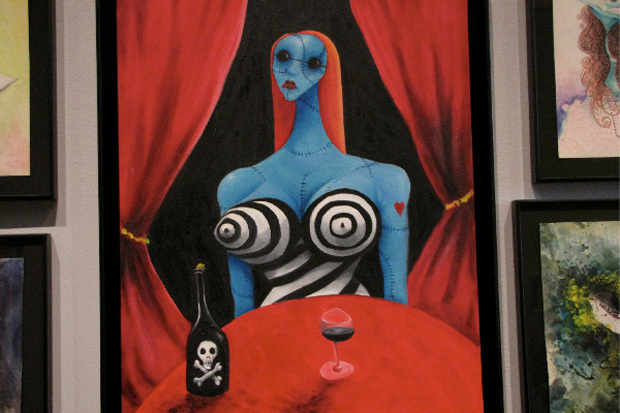 A note on the Tim Burton exhibit, which we loved. It comes with a great handout for kids. I love posts on what's new and cool in etsy. It's my favorite place to shop, so I love updates. This was a lovely post. 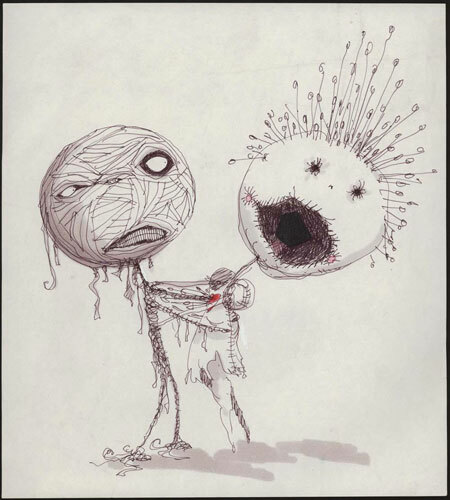 I love Tim Burton and cute monsters! I love the craft ideas and intro to new crafters. The events reminders don't hurt either! I would like to see more fiber artists. Thanks for the giveaway. What a neat giveaway. I am a HUGE fan of tim burton's style and aesthetic! The tutorials are pretty nice and the interviews. I really liked the craft fair type stuff though, how to complain and seeing someone's table all set up. I'd love to see more children products and also current craft festivals, etc. I really enjoy reading the tutorials and also learning more about the members and their products. There are a lot of really creative New New members and this blog is fantastic! I love this mug! :-D I like the crafting how-to's, but then I feel like a slacker because I don't try them. I LOVE reading about artsy stuff in NYC, but then I just wish I lived CLOSER! Mostly, I just like to see that small, independent artists have an outlet and get recognized - and sell stuff too! I just discovered this blog but I can already tell I'll be visiting the "how-to" section! I really like the crafting tips & Etsy info. On this blog, I'd like to hear a heartwarming tale of a person that now juggles fire only with the left hand, because of once using both hands to juggle chainsaws. On this blog, I'd like to see fuzzy puppies shooting harmless bubblegum-scented heart-shaped rainbows from their eyes. On this blog, I'd like to taste sweet, sweet freedom... but only if that freedom is sweetened with a trendy low-calorie, all-organic sweetener. On this blog, I'd like to smell even better than I do in real life. On this blog, I'd like to touch my toes. Part of my body where I slop beer when I am drunk and slurring. slang for lap. Oh wow, how cute. Thanks for the chance! Love the How-To's and I'm a huge fan of etsy! Thanks for the chance to win.